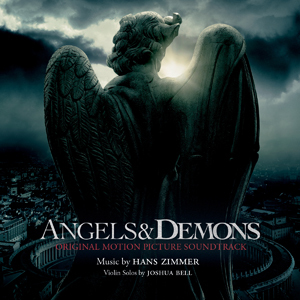 Sony Classical is pleased to announce the release of the original motion picture soundtrack of ANGELS & DEMONS featuring an original score by Academy Award?-winning composer HANS ZIMMER and solos by Grammy-winning violinist JOSHUA BELL, available May 12, 2009. Sony Pictures releases the highly anticipated film Angels & Demons, from the team behind the global phenomenon The Da Vinci Code, on May 15, 2009. Angels & Demons is based upon the bestselling novel by Dan Brown. TOM HANKS reprises his role as Harvard symbologist Robert Langdon, who once again finds that forces with ancient roots will stop at nothing, even murder, to advance their goals. RON HOWARD returns to direct the film, which is produced by Brian Grazer, Ron Howard, and John Calley. The screenplay is by David Koepp and Akiva Goldsman. Director Ron Howard again teamed with composer Hans Zimmer for the Angels & Demons score. This film score required an entirely different musical approach than the score for The Da Vinci Code. Zimmer found ways to make the music as agile and kinetic as Robert Langdon's firing synapses, He used, for example, a chamber group instead of a traditional orchestra to create that sense of action. Since Angels & Demons is equally about religion and science, Zimmer represents religion with the combination of orchestra and chorus and used electronics to denote science. As he put together the orchestra for the recording, Zimmer sought out the best and hired violinist Joshua Bell. Says Zimmer, "Joshua played like an angel with his violin framed by the contrasting starkness of the electronics. He added such beauty and grace to the music, and such depth to the characters. He is an extraordinary artist." Howard says, "There's nothing formulaic about the way Hans thinks about the score," adding that Zimmer's music always "suits the sound that the film calls for." In this case, Zimmer echoed the cinematic theme of hidden meanings by playing a musical game. As a nod to the symbologist character, Zimmer hid a five-note musical ambigram in the score. Whether or not anyone figures it out remains to be seen, but one thing is certain; as Howard says: Zimmer is "a fantastic storyteller." Click here to view an interview with Ron Howard and Hans Zimmer discussing the Angels & Demons score. An exclusive Sony Classical artist, Grammy Award winner JOSHUA BELL has captured the public's affection like no other classical violinist of his time. He came to national attention at the age of 14 in a highly acclaimed orchestral debut with Riccardo Muti and the Philadelphia Orchestra. A Carnegie Hall debut, the prestigious Avery Fisher Career Grant and a recording contract further confirmed his presence in the music world. Bell's 2008-09 season kicked off with the September world-wide highly praised Sony Classical release of Vivaldi: The Four Seasons recorded with the Academy of St. Martin in the Fields, his return to his alma mater – Indiana University's Jacobs School of Music as a senior lecturer, and the 10th anniversary DVD release of The Red Violin film featuring Bell as the soloist on the Oscar?-winning score. Hans Zimmer has scored over 100 films. He has been honored with an Academy Award?, two Golden Globes, and three Grammy awards. In 2003, ASCAP presented him the prestigious Henry Mancini award for Lifetime Achievement for his impressive and influential body of work. His most recent films include the critically acclaimed blockbuster The Dark Knight, the Oscar?-nominated Frost / Nixon, Kung Fu Panda and Madagascar 2. Zimmer's other wide-ranging credits include Gladiator, The Lion King, Rain Man, Driving Miss Daisy, As Good As It Gets, Something's Gotta Give, The Thin Red Line, Black Rain, Crimson Tide, Thelma & Louise, Hannibal, Black Hawk Down, The Last Samurai, The Pirates of the Caribbean Trilogy, Batman Begins, The Da Vinci Code, Green Card, and True Romance among others. For more information, please visit http://www.angelsanddemons.com/.